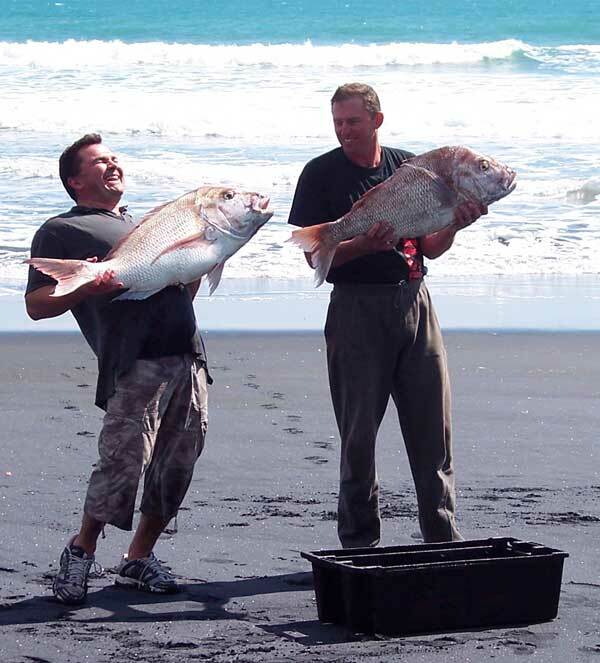 Paul Barnes is planning a free fishing trip to Muriwai Beach this weekend (8th or 9th December, 2007) if the easterly blow continues as forecast and would like extend an invitation to all who are interested in coming along. This is a free fishing trip! It was 6pm on Saturday 29th September, I had just been watching “Gone Fishing” when I received a phone call from Geoff Preston the Mokau kite fishing guide, advising me that howling offshore winds were forecast for the following day, full of excitement I told Geoff that I would meet him on the beach at 6am. 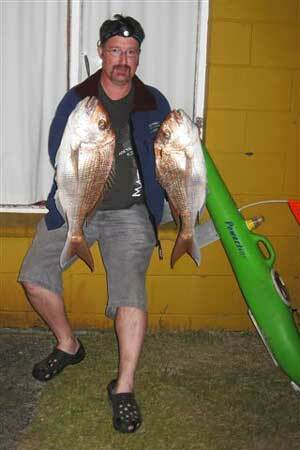 I had fished Mokau six times previously and had caught snapper up to 8.5kg. 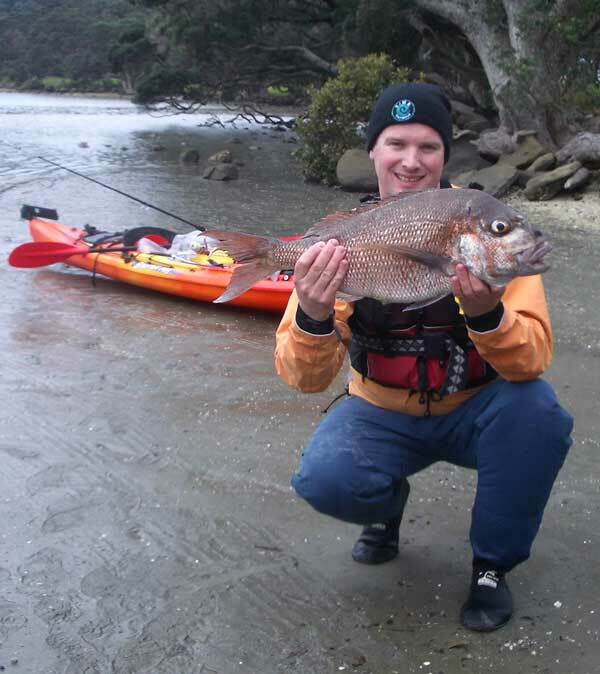 I didn’t know it at the time, but there was one really big Mokau snapper waiting for my arrival, it was to be one of the best kite fishing trips of my life. I quickly put down the phone and got the green light from the wife before loading the car for a 2am Auckland departure. I arrived in Mokau at 5:30am and had all my gear on the beach when Geoff arrived at 6.00am on his quad bike and told me he had already set his kite rig out and that it had been fishing for around an hour. We loaded my gear onto his quad bike and set off down the beach, he explained that you really need to be careful where you set because there are hidden rocks right along the beach that have claimed many kites and even more electric kontikis. Soon we arrived at one of his favorite spots where he had caught a lot of snapper over 10kg. I use a Mega Mouth kite - the same as Geoff uses - its got more pull than a freight train and can be flown in really light winds. In no time we had the kite heading out to sea and I baited the special Mokau traces that are made by Geoff. Just about everyone in Mokau uses Geoff’s traces. The commercial power-bait hooks are snelled onto a 50kg trace, which is covered by plastic tubing. This was confirmed later when we spoke to a guy who had been using rancid squid earlier in the week and had been catching nothing. Geoff had given him some of his fresh white squid and he landed a 10.5kg snapper the very next day. So we re-baited all my hooks with Geoff’s squid and sent them the full distance offshore (about 2.2km). With all the gear left fishing, we headed back to Geoff’s place. It’s a lovely little cottage perched high up on the hill in the center of Mokau, I was welcomed by his lovely wife Heidi, who served up fresh coffee and showed me photos of some of Geoff’s huge snapper that he has caught over the past six years, including a pic of his personal best, a 34.5lb monster caught this time last year. Geoff only takes photos of fish over 20lb and his photo album is full of them. After another fresh cup of coffee we headed back to haul in Geoff’s kite rig, it was only a two-minute ride on Geoff’s quad. After about 20 minutes we came to the first hook, it had a nice 2kg snapper, then I noticed that just about every hook had either a snapper or gurnard on. By about the ninth hook there was quite a crowd of people starting to gather. As Geoff was pulling the line back up the beach he felt a distinct “nod nod” which he reckoned meant we had a big snapper on. About three minutes later Geoff yelled at the top of his voice “there’s the big one”. It’s very entertaining when Geoff sees a big snapper coming in in the surf, you would think that he had just won lotto. He ran into the surf and grabbed the big fish it by putting his hands through the gills to ensure he couldn’t lose the 10kg plus snapper - the crowd cheered at the size of the snapper - and the fact that you can catch fish like this on a kite. By this time I was starting to wonder about what may be on my line? But before would could haul my rig in we had to look after the fish we had already caught, we quickly loaded the fish onto the front of the quad and headed back to the house to put them all on ice. In no time we were back on the beach and pulling my gear in. As we started hauling we could definitely feel that it was heavy, but were unsure what it might be. There were a lot more people on the beach waiting for us to pull the kite in. After about half an hour we came to the first hook, It was empty so was the second, then as Geoff was pulling the line back up the beach his arms were almost ripped from the sockets, he paused and said “WOW! I think there is a bloody big one on here.” About five minutes later he screams at the top of his voice that there is a huge snapper on. 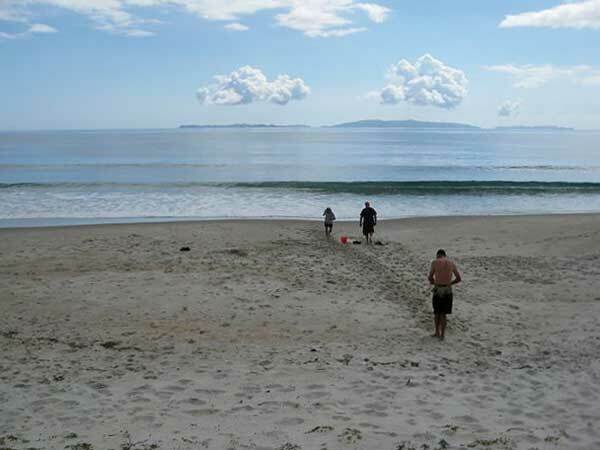 I left the reel and ran down to the waters edge where I followed the main line into the surf. There were pink and silver flashes through the foaming surf - it was huge - I didn’t hesitate and headed out into deeper water until I got to a position were I could get my hands into the gills of the monster. I lifted it half out of the water, the crowd of people saw it and cheered. It was so heavy I could hardly lift it with one hand. Finally I managed to get it to the fish bin where I could properly take in its true size. After answering the crowds’ questions we loaded the monster on the front of the quad and headed off to the local pub to weigh it. We inserted the scales into the fished massive lips and raised it into the air - the imperial scales read a mighty 29.5 pounds, but I think they might have been half a pound out. Above: It was a real joy to catch such a huge fish in such good company. We all shook hands and headed back to Geoff’s house. As we arrived Heidi saw the monster and was absolutely delighted for me. I would like to say a big thank you to Geoff and Heidi Preston for their hospitality and the experience of a lifetime. I have been land-based fishing the east coast for fifteen years and, while I have caught some nice fish, I have never seen anything like this one. 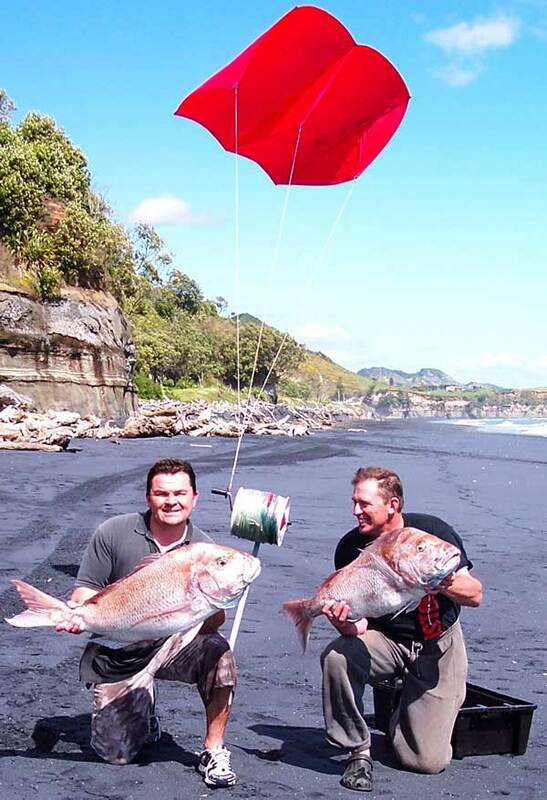 Mokau is a very special place and whether you are new to kite fishing, or you just want to catch a 20lb snapper, give Geoff a call - Ph 06 752-9780. He is a big snapper expert, and is very affordable. 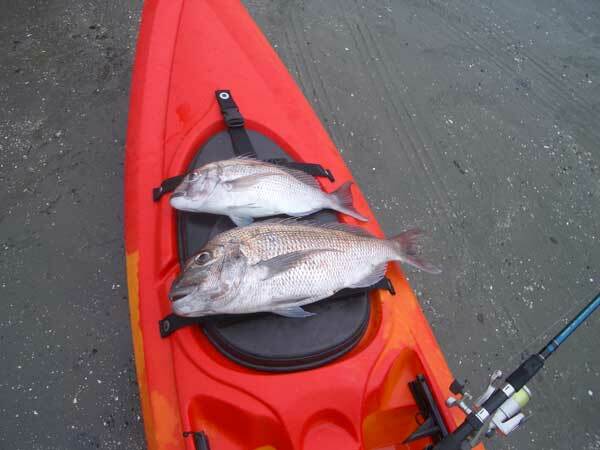 It was a reasonably warm, overcast day in Auckland and I spontaneously decided that I needed to do some more “research” for our guided kayak fishing tours, intending to try out some varieties of soft baits that I recently purchased. I only had a couple of hours and so I went to one of my secret spots just outside of Auckland and went for a paddle. The sea was perfectly calm and since there was a slight current along the coast, I just needed to paddle along the coast against the current and then drift back to the beach from where I launched. On the second cast my soft bait was pounced on by the magnificent snapper in the photo – what a beauty!! After playing him for about 10 minutes (I normally use very light gear, so care is needed) I landed what this evening I filleted packed and up as 5 meals for my wife and I. After another hour it was time to go home and on my very last cast (no joke) I landed another beauty, slightly smaller than the one in the photo. It was a short, intense and very successful morning’s kayak fishing and I’m still buzzing…until next time with booked clients. I have gone fishing four times in the last week and in each case brought home a very nice catch – so I suggest you grab your kite and try it in the coming weeks before it gets busy. If you don’t have a kite and/or don’t know how to use the one previously purchased from Paul’s Kites – no problem. Please contact us and we’ll show you how it’s done. Remember the small investment for a kite and gear can be got back in form of fish (and lots of fun) in a very short time! We left Auckland Friday afternoon and headed to Whangapoua Beach on the Coromandel. Finally got there at 7.30pm (after another detour due to a fatal road accident at Mangatawhiri). Were on Beach by 8.00pm and had the Powertiki out by 8.40pm. The tide had just started to come in with sunset at 8.20pm. We set at around 1200 metres offshore and left it out for around 30 mins. When the hooks started coming up beach it looked like they all had fish on. We kept eight, the smallest keeper was 33cm while the two largest were 4kg and 4.8kg. They were very nice fish. It took us a while to clean up and it was off to bed with anticipation as to the potential catch the next day. Unfortunately we had had our best fish. Photo Above: Fishing the next morning at the western end of beach with the Mercury Islands in background. The next morning we caught a number of snapper again - but only kept two at 36cm each. 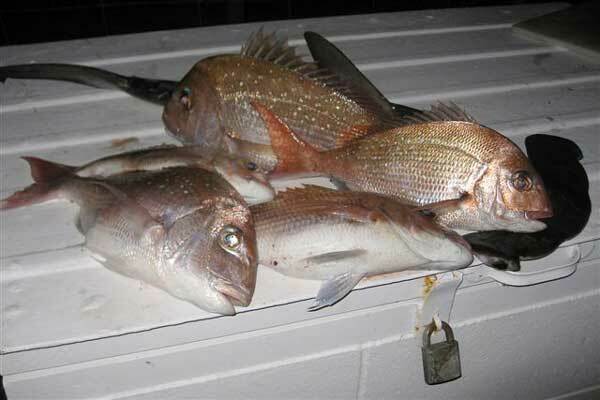 Photo Below: We fished again Saturday night and caught more good sized snapper and a small hammerhead shark. All our fishing was done with frozen mullet baits and all sets were left to fish for to 20-30 minutes. All the hooks used were 5/0 with a double float at each end for some variety. The floats offered no advantage to catch on this day but they were great confirmation of first and last hook. It was a great fishing weekend away, we took the kite with us but there were no favorable winds so we used the Powertiki Electric Kontiki instead. No one else was longlining at Whangapoua Beach during the weekend. It's a great location and I highly recommend it. Photo Left: We kept eight fish from the first set of our trip. The smallest keeper was 33cm while the two largest were 4kg and 4.8kg. They were very nice fish. Recently we converted our kontiki to a Kite Longline, using a Nighthawk Kite. Well the first time we took it out it was blowing 20-25 knots and did it go! Being newbies we were a little light on the front end weight so ended up with the bottle and three or four hooks taking to the air from time to time. Nevertheless we still managed to haul in two beautiful gurnard. Last Friday, the wind seemed right, so packed lunch and gear loaded, we set off to an east coast beach north of Auckland to fish the incoming tide. We had an easy set, except for the wind dropping a bit so we ended up with a bit too much weight which slowed the set speed. We set 25 hooks on a mixture of mullet and squid bait, and a mixture of standard and floating bead traces. I thought we might be lucky and get two or three. Was I ever wrong! When we retrieved the line we had eight nice Kahawai and one snapper. Three of the five floating bead traces caught fish. Needless to say we can't wait for the next time. And we are looking forward to buying a dropper rig so we can try the west coast. Many thanks for your service and help in getting us set up. I bought Flexiwing Kite Fishing Rig a couple of weeks ago and finally got the chance to try it out. On the first set we couldn't get it out far enough, it only reached 200 meters offshore. The next set we attached the skyhook for some extra pull and it went straight out to 500 meters. After 20 minutes I saw the kite was going down fast in a strange manner like something was pulling it. I started to pull back and it was really heavy and felt like something is pulling me back instead. Anyway I struggled for about 10 minutes and then the heavy load was gone. There was one snapper on the gear but the rest of the hooks were tangled. It was a good first session. I am sure there was a big fish at the end which was pulling me. What is the best way to handle this type of situation? I know with rod and reel you can let big fish play themselves out but have no idea what to do with kite style fishing. Ed: It's the same with kite and kontiki fishing as is it with a rod and reel. Always take your time with heavy fish and don't be afraid to let line out. Unclip the ratchet on the beach reel and don't worry if you have to let the fish take some line back out. Most big fish that are lost from kite and kontiki rigs are lost in the surf zone through the fisherman continuing to pull when the surge is running back into the sea. After a big sweeper hits the beach the surge runs back into the sea at five or six knots. This puts a huge load on the trace if a big fish is on. Simply let the line go back out while keeping a little tension on the line and land the fish as the next wave carries it in. So after weed-eating, mowing lawns and putting up some bunks in one of the rooms I headed off fishing. Went up to Tokorau for a late afternoon 4.30pm for an early evening change of light fish with my Flexi-Wing Rig on a rod and reel baited with strips of mullet. We sent the first set out with five Target Hooks and a snapper snatcher on the last hook, I left this out for just over 30 minutes and pulled it back in with half the baits untouched but with one snapper of about seven pounds on the last target hook. 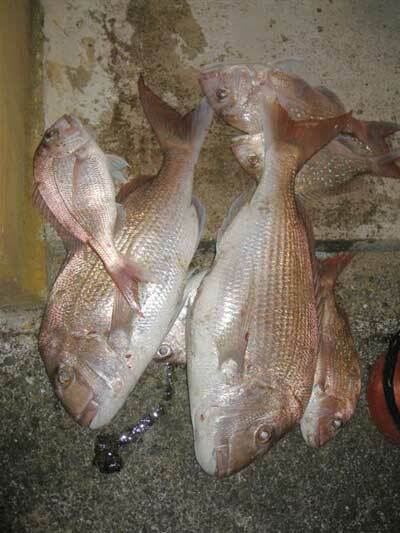 I re-baited the hooks and sent the second set out and caught another three snapper all between 35cm and 40cm long. The last set was sent out at 6.45pm right on change of light and I left this set out for about an hour but nothing had been touched when I pulled this in, I packed the gear away and got home at about 9.00pm and put the fish in the fridge and had them for breakfast the next morning. This shows you that a smaller kite rig like the Flexiwing on a rod and reel is so easy to use that you can set three sets in a little over two and a half hours after doing the chores and still be home early enough to get a good nights rest, it just shows you how easy the whole system is. Have you registered for the FREE KITE FISHING DEMO yet.